Your little girl can't be described in one sentence. You can't see her balancing books on her head in an act of grace or lining up for some kind of match making ceremony. It's not that she throws off all authority, she wants to make people happy. What would make her happier? A pretty dress or the ability to reach the top of that pole to retrieve the arrow on top? 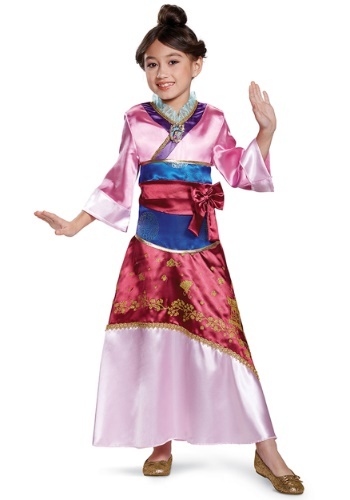 Give her both with this officially licened Deluxe Mulan Costume. While it features plenty of colors and ruffles, anyone who knows your little Mulan knows that she's more than just a pretty face. It'd be a great dress for her under cover position in the Emperor's palace while she's busy making sure none of those Huns are breaking in to take over the capital city! This dress has a literal lucky streak with a section of red and gold material standing for good fortune. The rest of the ensemble is chock full of gorgeous satiny fabrics with intermittent subtle Imperial patterns. It'll still be easy to pull off some sweet martial arts moves with the wide hemline of this gown and the wide sleeves. When she slips make through that upper window after showing that Hun who's boss, she'll still look like a refined lady with ruffles around her neck and a gold framed cameo of Mulan in the center of her bodice. So, this Halloween, give your princess with attitude an outfit that'll make her proud. After all, you never know when it's going to be time to get down to business to defeat the Huns!